Our command and control (C2) networks must be brought into the future, now. First and foremost, we must re-invent the acquisitions wheel, specifically figuring out ways to enable our small units to leverage the revolution in commercial information technological advances that our enemies are readily using. There is no reason that it takes us almost a decade to field a new communications device while our adversaries just pre-order the latest Samsung or iPhone, create an ad-hoc network over whatever waveform is available, and out communicate us at the tactical level. The C2 acquisitions system must be streamlined to allow our small units to rapidly test and field current and emerging technologies. 1st Squad, 1st Platoon, Company X is part of a company clearing operation and has a sUAS airborne that has identified an enemy position. 3rd Squad, 3rd Platoon, Company X is on the opposite side of the company formation, but the enemy is to his front. The squad leader, after being informed and shown by his infantry systems operator (ISO) or his assistant to the squad leader (ASL) and joint fires observer (JFO), is able to “see” what the sUAS is able to see, multiple kilometers away, and orient on the enemy. All the while, depending on the situation, he, his ISO, or ASL is text chatting and talking VOIP [voice over Internet Protocol] over Co Tac 4 to their very adjacent squad leader. Simultaneously, the company sees what the squads and small unit leaders are all seeing. Within seconds the battalion is tracking all the digital traffic as well, to include locations of all friendly units and any possible geometry of fire issues resolved. No traffic was passed over VHF communications, which are often degraded in urban environments, rather than optimized for them such as the NGHH/STC’s TSM-X illustrated in Figure 1. This scenario has been trained to and the operations order accounted for this – with no direction from higher the 3rd Squad Leader in 3rd Platoon understands his intent, knows he is able to defeat this enemy position organically, and he acts – Immediately and With Knowledge! Additionally, we have learned so far there is no such thing as too much information. There can certainly be poor information management, but increased information, if we have proper information management processes in place, becomes increased knowledge. Today’s Marine grew up in the Information Age and was nurtured by the Internet. Today’s Marine had Google instead of a hard spine encyclopedia. He is comfortable in an information rich environment. Just as Google organizes our search results, with simple information management techniques we can trust today’s Marine to sort and identify what information is critical to him at that time and place. Applications, common interfaces, and consolidation and sharing of information across all networks is critical. The Marine Corps would be wise to devise a flat network that maximizes information organization and sharing (simply!) and that will update as distant units come on and off the net. If our Service truly desires to achieve all that the MOC describes for our infantry small units, the 15 Marine rifle squad, as illustrated in Figure 2 is, at a minimum, the way to go. This organization accounts for the integration of advanced technologies to enhance the squad’s situational awareness and battlefield understanding per the unanimously approved Marine Requirements Oversight Council August 2015 Marine Expeditionary Rifle Squad (MERS) Initial Capabilities Document (ICD).5 This organization also provides the rifle squad the flexibility and lethality required to win the direct fire fight in a complex, most likely urban environment. The 13 Marine rifle squad is a proven construct to fight and win in complicated direct fires engagements. The employment of assault, support, and security is easily accomplished, squad leaders are able to effectively lead subordinate elements of “3,” and each fire team is capable of independent combined arms. This model has proven effective on islands in the Pacific, mountains in Korea, jungles in Vietnam, dense urban sprawl in Iraq and villages and intersecting farmlands in Afghanistan – in everything from daily patrols to deliberate attacks to straight up clearing in zone. We cannot afford to sacrifice the killing efficiency and combat power that three combined arms fire teams possess, but we do need to enhance their capabilities to provide the currently absent asymmetric advantages that the MOC mandates. The “new” fire team should be fundamentally constructed in the same manner as today. However, the fire team’s Marines’ weapons should all be M27 IARs [infantry automatic rifles], with one Marine still designated as the true “automatic rifleman.” This frees up the old “assistant” automatic rifleman to become a combat multiplier. Each fire team within the squad would have a different specialty training requirement for their new “combat multiplier” capability, creating enhanced fire teams with unique abilities that together enhance overall squad combat power. 1st Fire Team will have an infantry Marine with specialized demolitions and rocket proficiency, 2nd Fire Team an unmanned air/ground/water system (UxS) operator that will be operated as needed, and the 3rd Fire Team a counter-UxS. The strength of this model is that it builds a table of organization that allows the infantry to adapt to the future -- the combat multiplier is an infantry Marine with additional, specialized, and formal training which can be modified to fit future requirements. 1. M27 should be the Marine Infantry Service Rifle. Infantry Marines serving in the rifle squad should carry the M27 for its increased accuracy, cleaner operating system, and higher rate of fire. Some worry that equipping Marines with the M27 will lead to wasting ammunition, but we have found that through proper training, which would be enhanced through introduction at Infantry Training Battalion, the proper fire discipline is able to be taught and understood by Marines. Within the fire team, one Marine is still designated as the true automatic rifleman. The other Marines in the fire team carrying the M27 will allow the squad leader the ability to order his entire squad to fire on automatic as required. As a general rule, any automatic fire should be employed on the bipods (which should be improved and made more durable like the old M249 bipods) and at ranges up to 50m unless ordered by exception from the unit leader. The abundance of automatic fire enhances the close in, urban fight as well; for example, making entry into rooms. Additionally, one M27 per platoon should be given an improved scope to use in the designated marksman role. 2. The M4A1, which provides automatic fire but is lighter weight, should be the Marine Infantry Support Service Rifle and should be carried by the squad’s fighting headquarters as well as all unit leaders and those carrying crew-served systems. 3. Our rifles should be suppressed. This will cost money up front (but much will be saved in Veteran’s Affairs disability claims for tinnitus and hearing loss in the long term), but allows for a greater level of concealment/force protection and communication when in contact with the enemy. 4. The Carl Gustav should exist at the squad and platoon level. Its increased range and use by the U.S. Army, Special Operations Command, and key U.S. allies provides us increased, sustainable combat power when we have to fight ashore and integrate into the joint logistics infrastructure. The multiple munitions to choose from also grant new capabilities in the direct fire fight. An example for Range 400, the popular “standard” company attack of ITX: bunkers could be destroyed from Machine Gun Hill before closure occurs, greatly increasing the company and platoon’s ability to shape the enemy appropriately and increase tempo. The image below, taken by 3/5’s Kilo Company, highlights the battalion’s experiences with the Carl Gustav. 5. Precision guided munitions (PGM) must be brought to the company level as a way to reduce the amount of ammunition to be carried, increase probability of hit, and reduce collateral damage in the forecasted urban fight. This may be done in two ways. First, develop a PGM for the Carl Gustav (see China Lake’s Spike Missile as an example for innovation or possible adaptation). Second, increase the capability and use of light miniature attack munition (LMAM) systems. Currently, LMAMs provide the company commander the ability to support platoons and squads with a hip pocket PGM. Again, at Range 400 at ITX, we used LMAMs effectively, especially when teamed with other intelligence, surveillance, and reconnaissance (ISR) assets, to rapidly destroy the enemy 82mm mortar position. The LMAMs should be capable of using GPS or terminally controlled by each squad’s ASL and certified JFO. 6. The M320 Grenade Launcher. This weapons system is a reliable, proven grenade launcher used by the US Army. Attachment becomes an issue: The M27 becomes very front heavy and unstable, and is only mounted via drilling holes in the M27 handrail or using a different handrail. Our recommendation is that M320s be assigned to grenadiers as secondary weapons much like the old M79; M203s are still employed on M4A1s, and in the future a lighter weight, under-barrel mounted grenade launcher may be developed for the M27. Additionally, development of a medium velocity round that can increase the range and transition from an HEDP [high explosive, dual purpose] to an HE round would be advantageous for general purpose and more realistic for use against strong points often protecting enemy crew-served weapons. Malaysia’s Deftech unveiled a converted Rheinmetall MAN Military Vehicles Condor 4x4 logistics support vehicle prototype during Malaysia’s Independence Day parade on 31 August. The original armoured personnel carrier (APC) has been converted into a flatbed logistics support vehicle, with the primary intention of transporting and supporting Deftech’s Aludra unmanned aerial vehicle, though the vehicle can be employed for general logistics support as well. The conversion involves removal of the top half of the APC’s troop compartment and transforming the freed space into a flatbed to transport supply containers securely. With the passenger space eliminated, internal personnel capacity is now limited to only the driver and vehicle commander. Deftech is also considering the installation of an integral loader crane to facilitate loading and unloading. Jane’s has learnt that the prototype vehicle was developed in late 2015 by Deftech under a company funded initiative based on the requirement for a rugged mobility vehicle to transport the Aludra UAV. The Aludra UAV system had earlier been deployed under a services-based contract to support Malaysian Armed Forces operations in East Malaysia, although the contract has recently expired and is in the process of being renegotiated. Although the logistics vehicle variant is currently not a Malaysian Army requirement, then Malaysian Army Chief (now Chief of Defence Force) General Raja Affandi told Jane’s in April 2016 at the Defence Services Asia (DSA) exhibition that the army’s plan for the modernisation and upgrade of its Condor fleet – should funding for the program be approved – would include some of the fleet being converted into flatbed logistic transports. Deftech also displayed its Condor upgrade prototype at the parade. This effort involves the replacement of its 168 hp Mercedes Benz engine with a 215 hp Deutz engine, an independent axle replacing the rigid axle, an automatic transmission replacing the t manual transmission, and a new drop box which will increase the vehicle’s power output of 491 Nm at 1600 rpm to 800 Nm at 1200-1700 rpm. Em 20 de setembro último, militares colombianos visitaram o 6º GMF baseado no Forte Santa Bárbara, no município de Formosa-GO. Uma comitiva com membros da Armada da República da Colômbia (ARC) e da Força Aérea Colombiana (FAC), conheceram as especificações técnicas e tudo relacionado com o sistema ASTROS 2020, fabricados pela AVIBRAS. Durante a visita, foi realizada uma conferência institucional pelo comandante do 6º GMF, o tenente-coronel Elson Lyra Leal e uma demonstração do Sistema ASTROS 2020. Em 2013, a AVIBRAS teria oferecido seu sistema ASTRO 2020 ao Exército Colombiano, mas agora é a Marinha, através do Corpo de Fuzileiros, que estaria interessado em equipar-se com pelo menos duas baterias do sistema ASTROS 2020 para ser usado como um sistema de defesa costeira. O sistema ASTROS 2020 pode operar o míssil AV-MT 300 ‘Matador’ e o foguete orientado SS40G (180mm), o fabricante afirma que o sistema tem uma autonomia de até 300 quilômetros, cada bateria é composta por 1 veículo de comando e controle, 6 lançadores múltiplos, 6 veículos para munição, 1 veículo de controle de incêndio, 1veículo de oficina e 1 veículo meteorológico. A delegação colombiana foi representada pelo contra-almirante José Joaquim Amézquita García, diretor de programas estratégicos da ARC, pelo coronel César Felipe León Giraldo pela FAC, e o pelo capitão Jaime Gálvez Moreno da ARC, que foram acompanhadas pelo brigadeiro-geral José Julio Días Barreto, gerente do programa estratégico do exército brasileiro “ASTROS 2020” e do coronel Nereu Augusto dos Santos Neto, do Ministério da Defesa. Participaram também o vice-presidente comercial da AVIBRAS, José De Sá Carvalho Jr., o executivo de vendas da AVIBRAS, Patrício Enrique Bejar Rejas e o gerente da AVIBRAS, Elcio Prado Martins da Costa. A Agência Europeia de Defesa (EDA) lançou um projeto para aumentar as capacidades das Viaturas Blindadas de Combate Carro de Combate (VBCCC) em serviço no continente europeu, este projeto recebeu o nome de "OMBT-Leo2". No âmbito do projeto, a EDA espera transferir as plataformas disponíveis de Leopard 2 A4 que estejam excedentes em certos países para outros Estados-Membros. A iniciativa, conjunta e compartilhada, em um primeiro momento concentrar-se-á na locação ou venda do Leopard 2 A4 visando sua redistribuição. Posteriormente, esses carros de combate podem receber um pacote de atualização, transformando-os na versão 2 A7. A atualização das VBCCC para versões mais modernas deverá ter um impacto positivo no setor de defesa europeu e também contribuirá para a manutenção da excelência da Base Tecnológica e Industrial Europeia (EDTIB). O estudo de viabilidade produzido pela EDA fornecerá informações sobre o conteúdo e os custos do pacote de Suporte Logístico Integrado que poderá ser fornecido pelos parceiros industriais. O pacote abrange a manutenção periódica e agendada, além dos valores estimados dos custos do ciclo de vida dos blindados atualizados, de acordo com a EDA. A Norinco 122 mm SH3 tracked self-propelled howitzer was observed in service with the Rwandan Defence Forces (RDF) for the first time on 10 November, with President Paul Kagame’s office releasing a photograph of a vehicle that participated in a combined-arms exercise designated ‘Hard Punch II’. The SH3 superficially resembles the PLZ-89 in service with China’s People’s Liberation Army, but it is an entirely different vehicle, with a stated combat weight of 24.5 tons compared with the PLZ-89’s 20 tons. The variant was not previously known to have been exported, and no longer features in the Norinco catalogue. The system that participated in the exercise may have been one of six unidentified large-calibre artillery platforms that China exported to Rwanda in 2007, according to Beijing’s confirmation to the UN Register of Conventional Arms at the time. The RDF is also known to possess Russian-manufactured 2S1 self-propelled howitzers, which feature similar 122 mm D-30-derived guns. The Rwandan Ministry of Defence stated that Hard Punch II was carried out at the Combat Training Centre Gabiro on 10 November, and demonstrated “how different military capabilities are integrated and synchronised during a military operation at the level of an infantry division”. The Jordan Armed Forces (JAF) is retiring its 9K33 Osa (SA-8 ‘Gecko’) mobile surface-to-air missile systems as part of its on-going reorganisation, a Jordanian military source has confirmed to Jane’s . The JAF announced on its website in late September that it was offering 52 Osas for sale. The source said five countries and companies have expressed interest in purchasing the systems, including the Czech Republic, Poland, Ukraine, and a US company. Both Poland and Ukraine are still Osa operators, but the Czechs retired theirs in 2006. The JAF was considering contracting Belarus to upgrade its Osas, but decided to abandon the modernisation programme as it was unable to find the required money, the source said. The United Arab Emirates is operating a variant of the Leclerc main battle tank (MBT) fitted with applique armor. This armor is understood to be explosive reactive armor (ERA) made by Dynamit Nobel Defence (DND) of Germany. 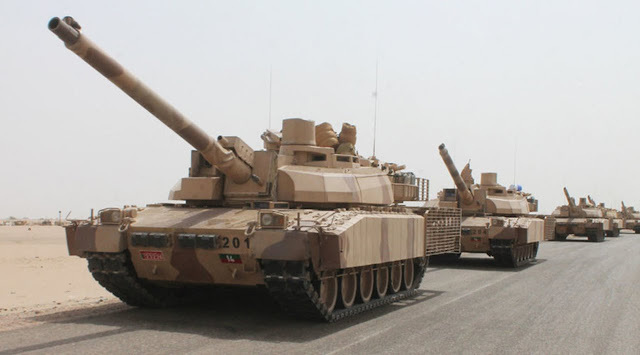 In 2016 the company was contracted by the military of the UAE to provide reactive armor kits for more than 200 Leclerc MBTs. According to the official report on arms export from Germany, the contract has a total value of €125.84 million, suggesting that each ERA kit costs about €500,000.